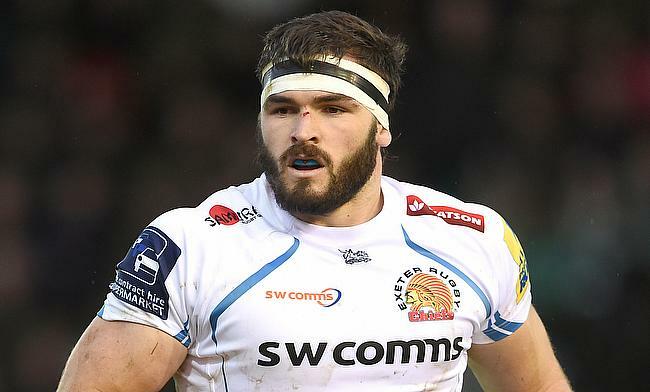 Defending champions Exeter Chiefs kept their hope of title win alive as they trounced Newcastle Falcons 36-5 in the Aviva Premiership play-off at Sandy Park on Saturday. The result also means we have a repeat of 2016 final as Exeter will face Saracens in the final battle for the championship on 26th May at Twickenham Stadium. Newcastle on their first ever play-off appearance in the history of the tournament were dominated from the start by Exeter. Joe Simmonds kicked three penalties in the first 30 minutes of the game to get them off to a promising start. The third three-pointer came at the back of sin-bin for Evan Olmstead for a deliberate knock-on. Dean Richard's men almost got through with one man until in the final minute when Lachie Turner breached the defence of the visitors before setting up Nic White over the line and a conversion from Simmonds saw Exeter score 16 unanswered points in the first half. Simmonds further extended Exeter's lead to 22 points with back to back penalties after the break but Newcastle maintained better possession after that and as a result Alex Tait capitalised a kick from Toby Flood to score their opening try which also ended up their only points in the game. Exeter bounced back hard when Olly Woodburn scored a 60th minute try and shortly Stu Townsend was disallowed a try by TMO. The Falcons could have repeated their try-scoring combination but this time Tait failed to ground the ball after collecting a kick from Flood but instead Don Armand capped off a fantastic game for Exeter with a 36-5 victory.